Andrzej Wajda’s Ashes and Diamonds exists in the liminal space between World War II and the Cold War. On 8 May 1945, as all Europe rejoiced, Poland faced an uncertain future. Having chased the Nazi invaders out, the Polish people were forced to confront a new threat from the Soviet Union. Wajda’s landmark film all takes place on this bittersweet day that encapsulates the contradictions of post-war Polish identity. Through the performance of Zbigniew Cybulski, commonly called “the Polish James Dean”, it also introduces one of the iconic anti-heroes of international cinema. The film’s potent national metaphors and heavily symbolic visuals also set the stage for the game of decoding and unravelling hidden political messages that has become so much a part of the appreciation of Eastern European cinema. While Wajda’s chief concern in his early war films is to dramatise his generation’s story, he also experiments with form, borrowing widely from many sources and influences. Ashes and Diamonds marks a maturation of his style as he moves further away from the bluntness of a more neo-realist approach. The plot is structured around making the characters’ chances of success seem tantalisingly within reach, but finally unattainable. Ashes and Diamonds was made during the period known as the “Polish October”, when a more moderate and culturally open leadership took power during the period of de-Stalinisation. It was a time of hope, haunted by past disappointments. Fittingly, it begins with a botched assassination attempt. 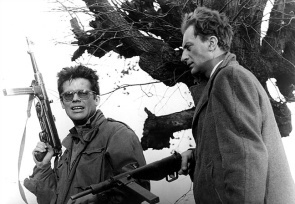 Maciek (Cybulski) and Andrzej (Adam Pawlikowski), two home army fighters, are ordered to kill an incoming communist party cadre, Szczuka (Waclaw Zastrzezynski) on the outskirts of an unnamed provincial town. They accidentally kill two factory workers instead, missing their main target, and must try again. The two men, strangers before being paired for the attack, go to the hotel where the commissar’s welcoming party is being held. Maciek meets the barmaid Krystyna (Ewa Krzyzewska), and the two have a brief, passionate affair, before he is pulled away from this fleeting happiness into his deadly mission. As the whole town celebrates the end of the war, Maciek – like Poland perhaps – cannot take part. There are no obvious villains in Ashes and Diamonds. Wajda has us sympathise with both the assassins and the communist official. In part this is a practical decision, since the film was being made under the aegis of the Polish government. The film was approved on the basis of its being an adaptation of a novel of the same name by Jerzy Andrzejewski, which centered on the communist official, Szczuka. After getting the go-ahead to make the film, Wajda changed the focus and shifted audience sympathy to one of the novel’s more minor characters, Maciek. Nevertheless, the director took pains to make Szczuka into a sympathetic character. He is an old Polish communist, more sympathetic than the new Soviet-influenced breed, partly through having fought Franco’s fascist forces in Spain before World War II. His estranged son is in the home army; we see the young man captured by his father’s comrades. Szczuka, like all of the Poles in the film, is being pulled apart by the Soviet takeover. Wajda chooses not to focus on the invader, but dramatises how this intrusion sets countryman against countryman. The tragedy of this civil war is best represented in one of the final scenes of the film where a killing is impossible to distinguish from an embrace. Contrasts like this are the stylistic principle by which Wajda brings the film to life: as a patriotic song is sung in the dining room, Maciek and Andrzej set fire to glasses of vodka in memory of their fallen buddies; in the final scenes of defeat and loss, the hotel guests dance a drunken Polonaise in celebration of victory. Maciek and Krystyna find love and hope, even as their future is being snuffed out. In his previous films, A Generation (1954) and Kanal (1956), which along with Ashes and Diamonds have come to be called “The War Trilogy”, Wajda remained more faithful to a kind of documentary reality. Both earlier films have symbolic scenes and characters, but not to the extent of Ashes and Diamonds, which moves almost completely into the metaphoric realm. Abandoning realistic time and space frees Wajda to make the poetic contrasts that illuminate the film. It allows us to accept the surreal touches like the sudden appearance of a white horse, or an upturned statue of a saint, symbolising lost innocence and a fallen world. Like Antonioni in Italy, Wajda moves towards depicting a kind of psychological and political truth with the same intensity that earlier post-war filmmakers had approached by documenting the material and physical devastation wrought by the war. Wajda has credited John Huston’s The Asphalt Jungle (1950), and the films of Orson Welles, as major influences on Ashes and Diamonds. Huston’s unrelenting portrayal of human venality and doom permeates Wajda’s film and Sterling Hayden’s haunting, stumbling death among the horses in the Kentucky bluegrass is referenced more than once. Wajda borrows Welles’ low angles, high contrast lighting, and deep compositions to intensify and stylise the visual world of the film. Cybulski’s individualistic performance and anachronistic ‘50s costume further remove the film from any realistic portrayal of the events of 1945. Audiences were also meant to view the film as a statement about the contemporary world. Cybulski speaks for a new, younger disaffected generation, reassessing its past and uncertain of its future. In this complex and beautiful film, Wajda finds a way to lucidly express confusion and capture the soul of a people constantly trapped by the forces of history.